Spirit Falls (Royalston, MA) isn’t a single waterfall, it’s a series of cascades that course through a steep slope covered with boulders. Canon5DM4, 70-200/4@91mm, F16, CP, 2.5 sec. Really like this, an excellent combination of slow shutter speed and high contrast. Very creative combo of perspective and shutter speed. Love the zig-zag motion. Gorgeous contrasts-as EJ says, the perfect combination. Love the sharp focus on the ice. To add what others have already said...I also like the criss cross of flow and the depth in this! A well executed shot, Thomas.Love it! Outstanding! Congrats on the well deserved EP. The B&W is perfect. 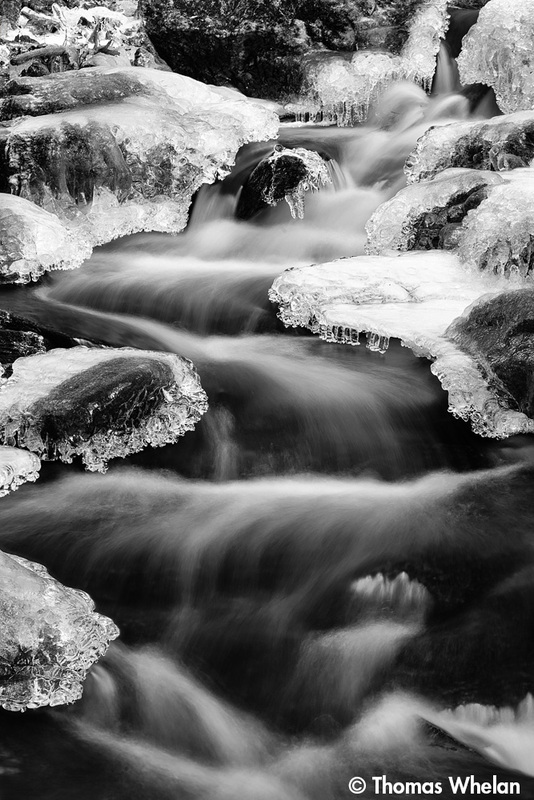 The razor sharp ice combined with the soft motion effect in the water is stunning.